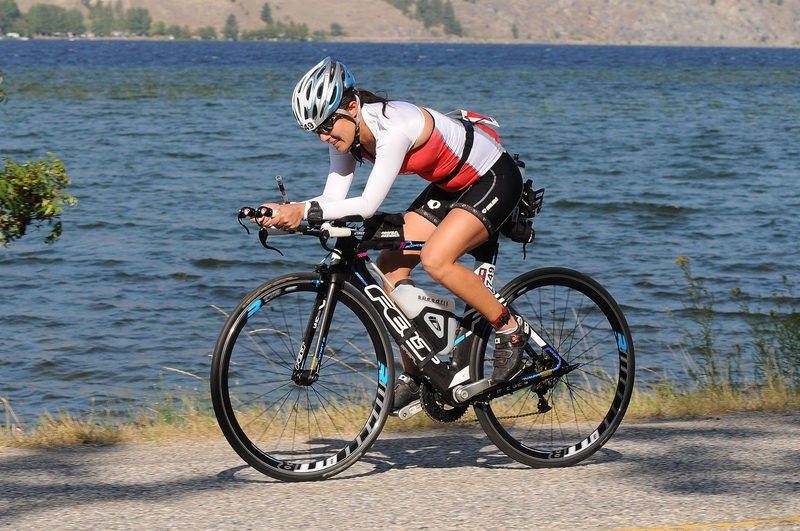 My Ironman journey began 2 years ago when I spectated and supported friends at Ironman C’oeur d’Alene in 2010. I knew back then an Ironman was something I wanted to accomplish. I had just started to learn how to swim and signed up to do my first triathlon, which was the Big Kahuna 70.3 mile half distance in 2011. 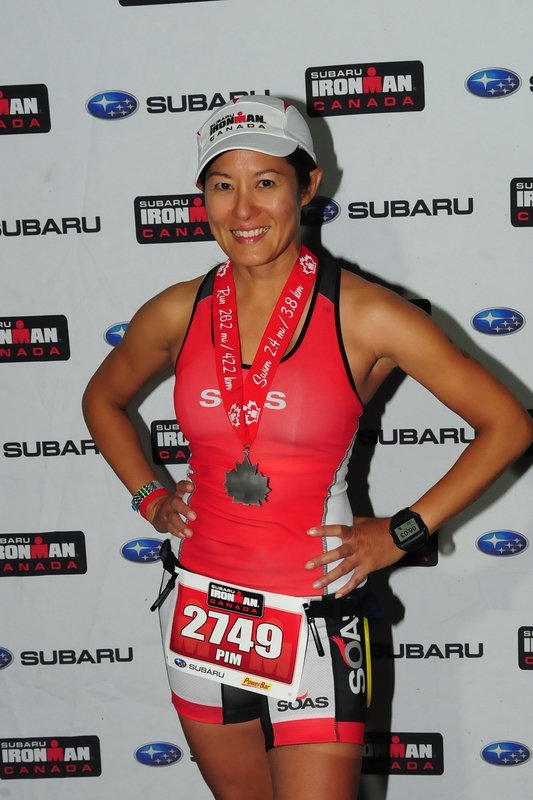 One month prior that triathlon, I spectated and supported friends again at Ironman Canada. 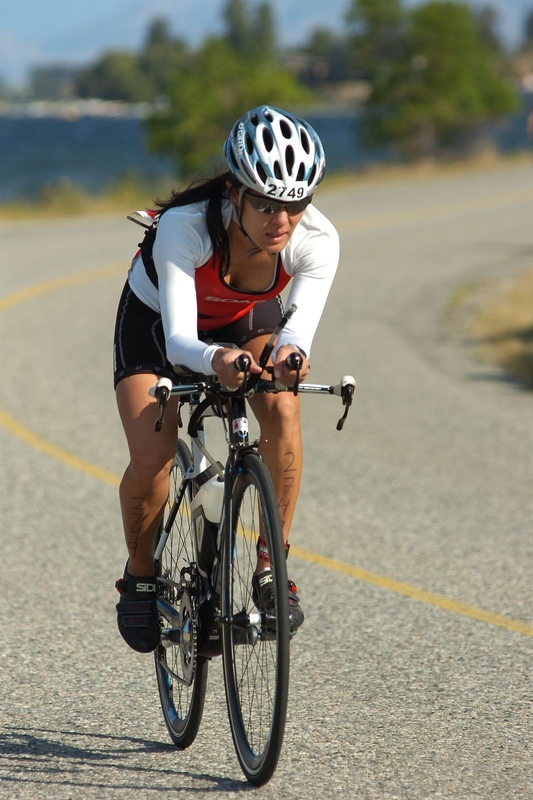 After an enjoyable practice swim in the calm and warm waters of Lake Okanangan and driving most of the gorgeous bike course which were surrounded by vineyards, lakes and mountains, I decided that Penticton, BC was the place where I wanted to do my first Ironman. 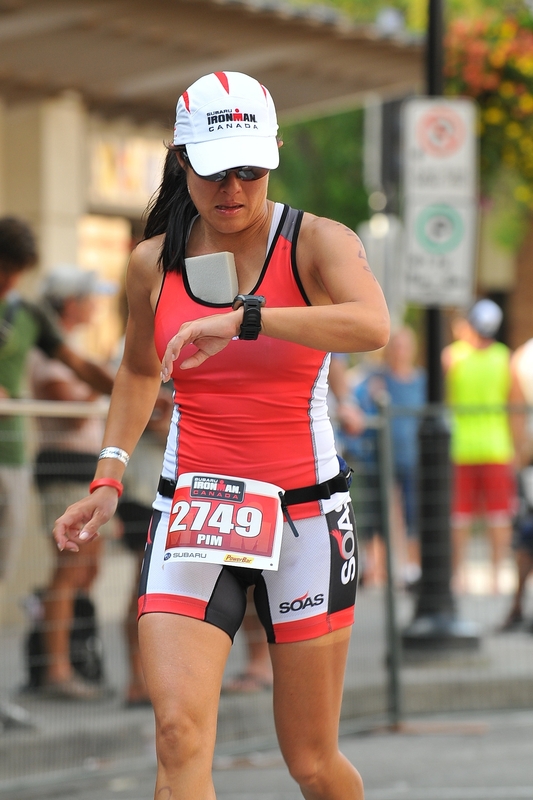 I stood in line by myself and signed up for Ironman Canada in person, before I had even completed my first triathlon. 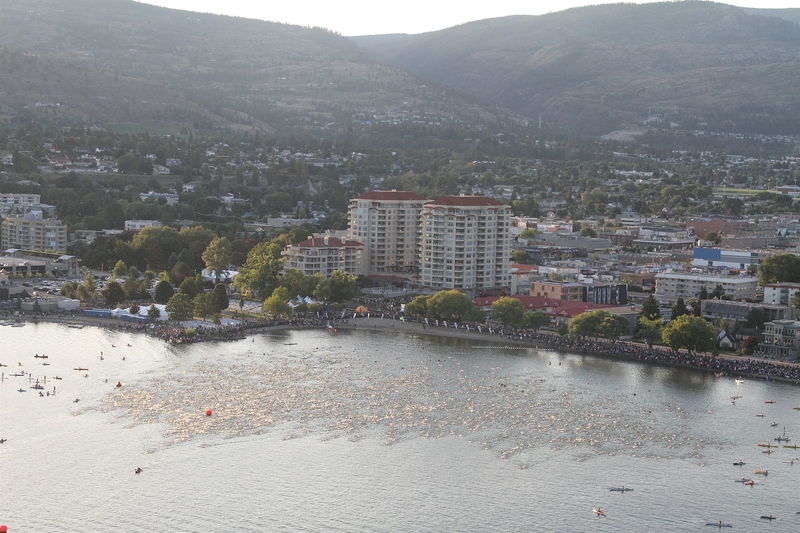 I’m back in Penticton, BC, Canada on August 26, 2012, 1 year later and getting up at 2:45 am to fuel my body for the big day. I ate a bowl of chicken rice soup (70 cal + carbs + sodium), drank Ensure (350 cal + protein) and ate 1 frozen blueberry waffle (220 cal + carbs) for a total of 640 calories plus a can of coconut juice for electrolytes. I tried to go back to sleep. I barely slept for 2 nights. I was too anxious. After dozing off I was up again at 4:30 am and tried to eat some more. I was still too full. I grabbed my special needs bags, wetsuit and frozen bottles. Ron gave me some words of encouragement and a big warm hug. I then head out to catch the 5 am hotel shuttle to the race start. On the shuttle bus I see nothing but really fit triathletes. They all look like they’ve done this before. I’m feeling inadequate and even smaller than my 5’3” stature. I then see Eric and Todd board the bus. I’m at least relieved to see a couple of familiar faces. I bring an oatmeal bar to eat and an electrolyte to drink during the drive but I really don’t feel like eating. It’s dark out and I’m cold. The air temperature is about 60F and the water temperature is 71F. Maybe the water will feel warm since the air temperature is cooler. The air temperature will warm up to 84F. Perfect day for racing! After I get my wetsuit on, I down a Gatorade pre game gel drink for a quick 120 calories and continue to drink my electrolyte drink mix. It has been now 3.5 hours since I’ve last eaten. I want to ensure I am well fueled and hydrated. I took great care to ensure I was well fueled and hydrated for several days prior to the race. Due to my history of cramping, I was going to do everything I could to prevent cramping … or so I thought I did. I feel fairly calm but excited. I made a good effort over the past year to improve my swim technique and gained a sufficient amount of open water swim experience. I felt comfortable swimming 2.4 miles. However, I have a torn rotator cuff and had to remain very conservative while training and competing. 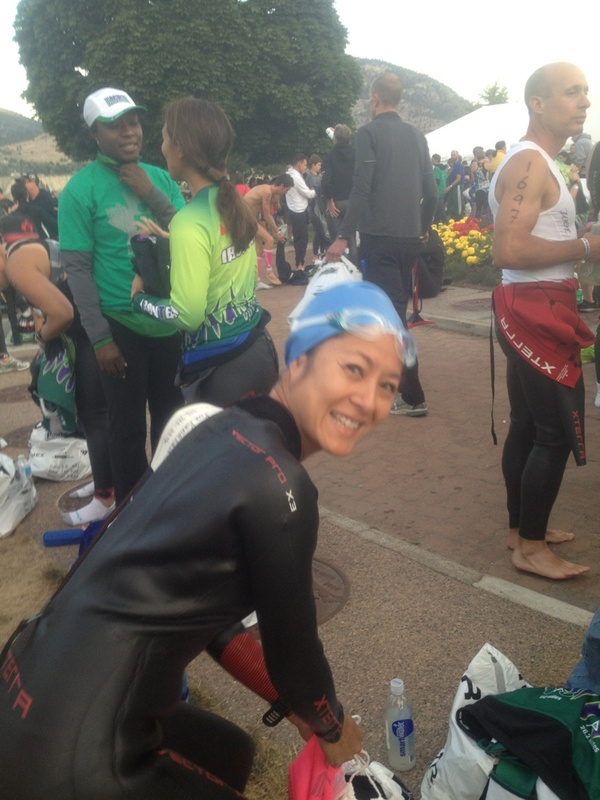 Coach Tom and I knew going into this, my swim would be all about just getting through it conservatively with enough energy reserved for the bike and run. 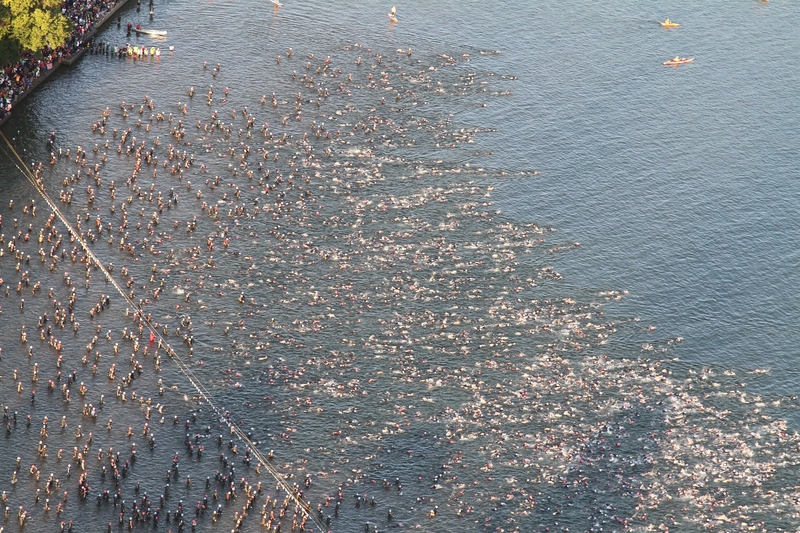 This would be the largest mass swim start that I’d experience with nearly 3000 athletes. I’m worried about getting kicked in my bad shoulder and in the face where I might lose my goggles. Having lost a contact at my last half Ironman triathlon. I packed an extra pair of contacts in my T1 bag just in case. It was no fun riding my bike at Vineman with 1 contact missing. Ron and I agreed to meet near the peach to wish me luck and a photo. I could not find him and was getting more nervous so I headed for the water. After a short warm up swim I tried to find him again with no luck. That’s ok. I know you were out there! The water always feels cold to me. I tend to run much colder than most people. A fellow male athlete observing me shivering smiled and asked “are you cold?” He thought the water temperature was perfect and couldn’t believe I was shivering. The next few minutes would go by very quickly. A few of my friends from the Team in Training’s Ironteam call me over. Jerrold tells me the plan is to wait 5 seconds after the start and then we’ll all start swimming together. Then, the horn blows and Jerrold turns to me, waves me with his hand and says “C’mon Pim, let’s go, let’s go.” I must have looked like a scared child. He turns again, and tries to coax me to start swimming, “C’mon”. I slowly follow him in. A few people touch my feet and a couple actual grab my left ankle. I don’t understand why people need to grab other people’s feet. I kick gently and they let go. Jerrold is a stronger swimmer so I don’t try to draft behind him although if I had to do it over again, I should have. You are supposed to draft behind a stronger swimmer. Here’s where I made the first of 2 critical mistakes of the day. I found a lady to draft behind who seemed to be swimming steady. I notice she’s a bit slow but I can easily stay behind her. At times, I actual swim up to her so I back off. I can tell I am a more efficient swimmer than she but made a poor newbie decision and I tell myself that I am going to follow behind her until the 1st turn dubbed “chaos corner”. The plan was to take off on my own once I made the 2nd turn which about 1.2 miles into the swim. The water was clear and I can see fish. I am relaxed and enjoying the swim. I am hardly putting in any effort. I’m basically floating along doing a 2 beat kick at low cadence. When we reach the 1st turn, I look down and see 3 scuba divers laying on their backs on the floor of the lake and staring back at us. One of them sees me looking at him and waves. I wave back. While the lady I was drafting off of was swimming on target, she would often just stop to sight. This slowed me down even more since I was following her and had to stop too. Darn, I wish I just had the confidence to go around her. I had never done this at the Catfish Crawls, why am I choosing to do this now? Nerves I think. Typically there are just a couple of official boats and lifeguards in kayaks or on surfboards at shorter distanced triathlons. Today there were lots of people spectating from boats all lined up along the home stretch back to shore. This made it hard to spot the 2nd buoy. There were so many vessels in the water in your field of vision. Fortunately, there were spectators on a boat nearby cheering us on. They point to where the next buoy was. As I go around the 2nd turn and head back to shore, I felt the fingers on both of my hands start to stiffen. I tried to shake them out and open and close my fists while swimming. I made a point to relax my entire body during the swim so the cramping was not due to being too tense. I felt cold. I then felt my hamstring cramp on 1 leg. Then it’s my calf on the other leg. I flexed both my feet while swimming which slows me down. The pace of the lady I was drafting off of is now the perfect pace since I’m cramping. I am in no condition to pass her as planned. The cramping passes and then comes back. This would continue on and off for the remaining 1 mile swim back to shore. Sigh. I knew this could potentially impact the rest of my race. I’d have to wait to see what happens when I get out of the water. I remained calm and when the cramping subsided, I broke free from drafting and made it to shore. I struggled to stand up in 2 feet of water. My legs cramped up again and they really hurt. This happened to me at Big Kahuna last year where the water was cold. I hobbled along and tried to get my legs moving across the timing mat. I see that my time is about 2 hours! The swim cutoff is 2:20. I was expecting a time of 1:30 – 1:45. I swam way too leisurely and spent too much time in the water. No wonder I was so cold. My fingers are too cramped to pull the wetsuit off my wrist. I tell the wetsuit strippers that I am cramping and one guy helps to pull my wetsuit off my arms. I told them I couldn’t sit down because of my cramping. Two of them grab my arms and lay me down gently, pull of my wetsuit, and then pick me up onto my feet. Thank you! I heard the next day that there was a woman who cheated and swam with white flippers/zoomers. She pulled them off about 100 yards from shore and left them floating in the path of other athletes behind her. How selfish! If I saw her, I would have totally pointed her out on the beach to all the spectators and race officials. She would have been disqualified and the Ironman rules are that you can even be banned from future Ironmans. I think this is a good rule. Anyone caught taking a short cut on the course or cheating in any manner should be banned. It is bad for the sport and immature of the athlete who cheats. You are only cheating yourself and it is not the responsibility of others to call you out. Each individual athlete is responsible for racing with integrity. You will lose a lot of respect from fellow athletes if you cheat and you will have no one to blame for that other than yourself. 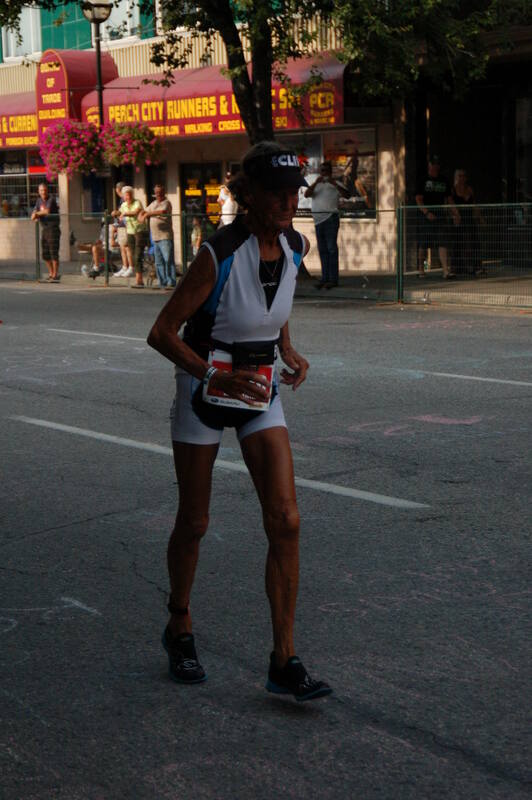 I know someone who DNF 2 times at IMC but had the courage and belief in herself to successfully complete this Ironman in her 3rd attempt. Those are the people I admire. As for the cheaters, it tells me you gave up on yourself. I already read a random blog about other athletes seeing the woman with the white flippers. I met a man who said his friend was right behind her and will try to report her since he knew her swim finish time. The timing mats and technology rarely fails at these races. The timing mats tell an honest story about how you are racing and in this case, may identify the cheater. In the changing tent, I try 3x to put my socks on, once by standing, once sitting in the chair and once again standing with my foot on the chair. It wasn’t going to happen. The cramping went all the way up my hips. The wonderful female volunteers tell me not to worry and put my socks and bike shoes on for me. After they help me get dressed, they bring me a fleece blanket and wrap it around me. I am still shivering. One lady asks for permission to use her body heat to warm me up while the other lady rubs my legs. They suggest I sit in the sun with a blanket but I tell them that I am ready try to get on the bike. That’s the best way to warm my muscles up. I briskly walk out of the changing tent. It’s not hard to find my bike. As a novice swimmer, my lonely bike is typically one of the last bikes left on the rack. That’s ok. I’m use to it. I pedaled off slowly. I knew that I needed to do 2 things immediately. I needed to eliminate the cramping and I needed to stick to a plan to ensure the rest of my day went well. I needed to warm my muscles up slowly. I am one of the last few athletes left. I am not going to try to catch up to anyone. I spun my legs at a high cadence but lightly. I would remind myself to ride “featherly light” for the entire 112 miles. Ron was anxiously waiting for my appearance out of T1 and I am happy to see him. I want to explain to him what happened but I need to keep riding slowly. I’ll fill him in later on the course. Although I knew my cramping was not from dehydration, I took some additional salt sticks and started to catch up on my electrolytes and hydration. I knew that I was already in jeopardy of not finishing under 17 hours right off the bat. I was experiencing my worst case scenario 2 hours into the race by cramping up so badly. I needed to make smart decisions. I knew Ron and Coach Tom were wondering what the heck happened to me. I should have been on the bike a long time ago. Don’t worry guys, I made the right decision to dial my effort back even more. I made a decision to ride at least 1 mph or more slower on average than originally planned. Later Ron would tell me that Coach Tom was concerned I would do the opposite and push myself too hard on the bike in order to make up the time. Don’t worry Tom. I knew that by just staying relaxed and dialing back my effort I could reserve enough legs to gain time on run. You had coached me well. For the 1st 20 miles, I picked a lady who had a Tribe jersey to follow. I didn’t know her but I knew that most of the Tribe folks were very experienced triathletes so I committed to letting her pace me. Eventually, I was able to pass about 50 people by the time I descended Richter Pass even though I was pedaling at 65% effort. My bike and run effort is based strictly on heart rate. Everything is going as planned. My average heart rate for the bike was 141 bpm. Perfect! I still maintained a moderate heart rate around 150 when climbing Ritcher Pass and Yellow Lake. I tried to greet as many athletes on the bike as possible. I looked up often and made sure I saw everything. I wanted to remember this race. I made a point to take in my nutrition diligently. I had enough nutrition for a 9 hour day. I knew I would not need all of it but I wanted to have some reserves to prepare for a flat tire or accidentally dropping my nutrition on the course, etc. Horray! I got my nutrition down. My stomach feels good and I have maintained a strong level of energy. I didn’t mind any part of the ride. Well, maybe except for when a man passed me saying “Good job Pim”. He had 70 written on the back of his calf. Really? I tell myself that this 70 year old probably was a former top age group finisher and qualified for Kona when he was younger. I didn’t try to pick up my pace during any part of the ride. The cramping in my legs come and go. I kept trying to hydrate and take electrolytes. In hindsight, since my cramping issue was caused by the cold water, I don’t know if I needed to catch up on my hydration so much. I had to stop to pee 4x on the bike. I’m not ready to pee on the bike yet. The thought of sitting in bike shorts soaked in uric acid and bike socks soaked in the same does not appeal to me. I normally don’t need to stop that much while on a long training ride. I wonder if my body was telling me I had enough fluids in me and was getting rid of the excess. The problem is, once I get a cramp, no matter what the cause, it is hard to get rid of it. I basically have to live with it for the rest of the day in some manner. Maybe I needed to have pickle juice waiting for me at T1 after the swim? I didn’t mind the out and back through the vineyards at around mile 70 where we picked up our special needs bag. The ride through the vineyards was longer than I had expected. I road it even slower thinking I’d spin my legs out so I don’t cramp up when I stopped at special needs. People I had passed earlier started passing me and that was the only time I thought, oh gee, I’m riding way to leisurely. I pick up the pace slightly. I stopped to drink about 1/3 of a coke and eat a turkey sandwich. I had frozen both the night before and placed them in my special needs bag. It was divine! The coke was still cold. I chatted with the volunteer guy and it was the first time I asked for the time of day. He said I had plenty of time to finish. As I continued on my ride, I tried to thank or nod my head to anyone who cheered for me. Having spectated 2 Ironmans, I truly appreciate the effort it takes to spectate. It’s not easy. There were many times I saw a woman or man sitting by themselves on a beach chair in a remote location on the side of the road cheering people on. I’m sure they were there for their friends and family but they still cheered on everyone else that went by. The entire time, I smiled to myself and took it all in. It was the most marvelous bike ride of my life! At no point did I wish it would come to an end. At no point did I really want to get off the bike. The decision to wear the heavy duty bike shorts then change into tri shorts for the run made for a comfortable ride. I tried to relax my neck and shoulders in the aero position. I spun my legs featherly light and did not feel fatigued at all. I was preparing to run a marathon after. I thought Yellow Lake was at mile 80 so I rode very conservatively in preparation for the climb. It turns out it was at mile 90. That’s ok. I conserved some more energy. I climbed up as relaxed and easy as possible. I resisted the urge to go faster and even slowed down when I saw Ron and Patty waiting for me near the top. Ron ran next to me and I was able to update him on what happened on the swim and how the bike was going. He said they were wondering what happened to me after the swim. He assured me I had plenty of time. The downhill back to Penticton was a lot of fun. On one of the descents I reached a maximum speed just over 41 mph. I was able to get into the aero position but weighing only 106 pounds, I did get blown around in the cross winds a bit so I had to hit the breaks a few times. It was nice to ride back into civilization. There were athletes already finishing their run and I saw some of my friends on the run course. I am behind the pack but I know I will continue to pass some more athletes on the run. I had already passed over 100 people on the bike. I had managed the bike course well. Whoo hoo! I felt like a professional athlete having a volunteer grab my bike and rack it for me. It was nice to change into a fresh pair of tri shorts and to be able to wipe my face. On my way out, 2 cute young male volunteers help to apply sunscreen to my shoulders and back. I teased the guy who was applying the sunscreen to my legs saying “ooooh, nice leg massage”. He then applied more pressure and massaged my left leg for real and then the other leg while applying sunscreen. Thank you! I wanted to stand there longer but needed to get going. Legs felt great! I had good energy. My plan was to take it easy for the first 6 miles I had trained running up to 18 miles so why not just eliminate the 1st 6 miles and turn it into a 18-20 mile run? Ron told me, even if I felt like running, I should try to walk a lot in the beginning. Save it for the last 6 miles. I see Ron around mile 2. He told me that Tom said to keep smiling. I have my Garmin set at a 5:1 run/walk interval. At the 1st water stop, I would make my 2nd newbie strategic mistake. I decided to take a drink of the electrolyte drink mix they offered on the course. I have not consumed this particular brand in over 2 years because it didn’t always agree with me. Doh! I felt pretty good and there were no signs of cramping but I was worried the cramping might return. I risked drinking the electrolyte drink mix because I wanted to ensure I kept my hydration and electrolytes in balance. I had stopped to pee 4x already on the bike and once at the start of the run, so I was worried that I was peeing out all of my electrolytes even though I was also taking in a lot of salt sticks. I hold off on consuming any coke until mile 13 but I do take a few gels along the way. I feel pretty good! When I run my intervals, I am running between 9:30 – 10:30 min/mile pace. Perfect! I try to make sure it is closer to 10:30 – 11:00 min/mile to start. My goal is to negative split and Coach Tom gave me permission to “race” starting at mile 18. I continue to have to stop to pee a lot. I think at least 6 more times! This causes me to drink more electrolytes and take in more salt. My stomach starts to feel discomfort. Uh oh. I feel ok at mile 11 and catch up to Jerrold. We run for a bit until I get to the special needs turn around. I start drinking cola on the course. I was looking forward to it. The combination of the carbonation and caffeine is wonderful. However, my stomach is not liking the mix of gel, salt, electrolyte drink mix and now cola. My tummy starts to turn sour fast. I am unable to stick with my run/walk intervals. I can only run until my stomach hurts too much. That is ok. I know I will finish this race within the time limit but any time goals went out the door. It actually went out the door on the swim, but I was hoping to make up some time on the run. I’m a little bummed because my legs can run! I have no cramping and I have a lot of energy and legs left! Whenever I am able to run, I can run a 9:30-10 min/mile pace easily. The rest of my run will be dictated by my stomach. I finally catch up to 82 year old Sister Madonna Buder. 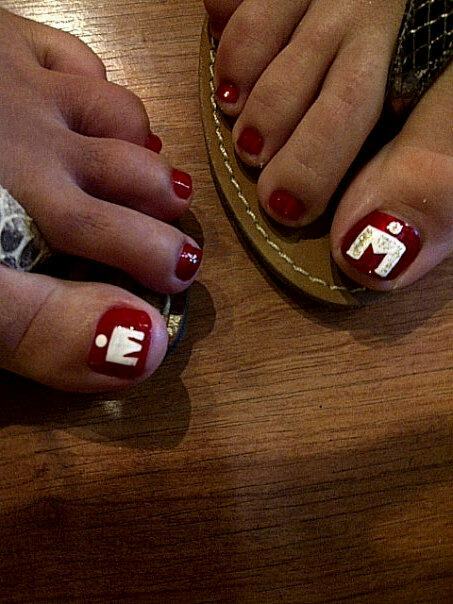 She is a bit of a celebrity in the Ironman world. 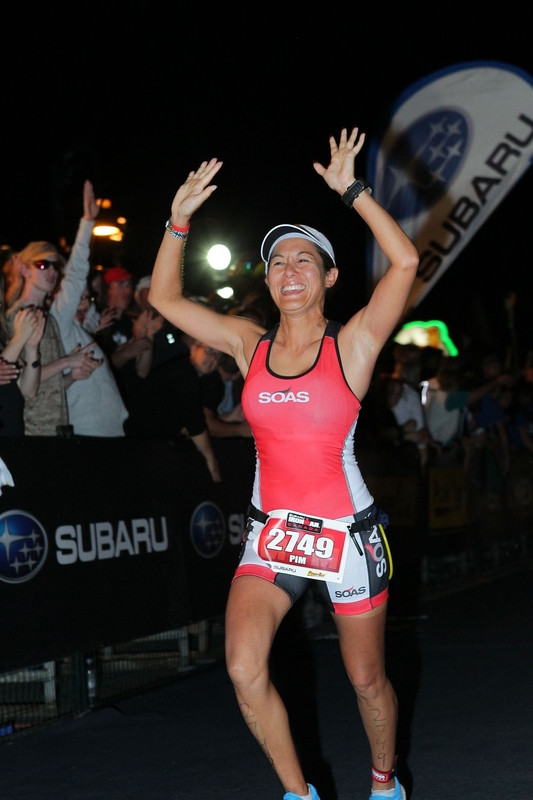 An experienced triathlete, she holds many records and has completed about 45 Ironmans! I tell her that she’s doing a good job as I run on by. If she acknowledged me, I would have ran with her but she stayed focused. Next thing I know she’s chasing me down! I can hear her breath behind me. I feel a little guilty passing her but at least I got her going! What an amazing lady. It is dark now and there is a whole other feel to the race in the dark. People are mostly walking and running whenever they can. I still had spring in my legs so I got a lot of comments from other athletes and spectators about my good pace and running strong. Jerrold catches up to me now and he tells me that he took an Advil, Tums and changed his socks and now got his second wind. I probably should have taken a Tums too but I was afraid to put anything else into my tummy. Jerrold tries to motivate me to get going with him. We finally make it into town. For the last 6 miles I can only manage a sip of coke and a sip of water. I stop drinking anything for the last 3 miles. I see Ron again and I tell him about my stomach issues. He tells me he’ll see me at the finish. I know I will finish in time. I’m just enjoying the rest of the run at this point and trying to take it all in. There are more spectators on the streets. I see Jerrold up ahead going strong. I’m so happy for him! Running is his weakness and I have witnessed him improve his running tremendously. His energy inspires me to keep going. I do feel like vomiting and all I can think of is that I don’t want to puke in front of all the spectators. The last 2 miles are very exciting and there is so much energy in the air. People are cheering you on like crazy. I try to thank everyone. 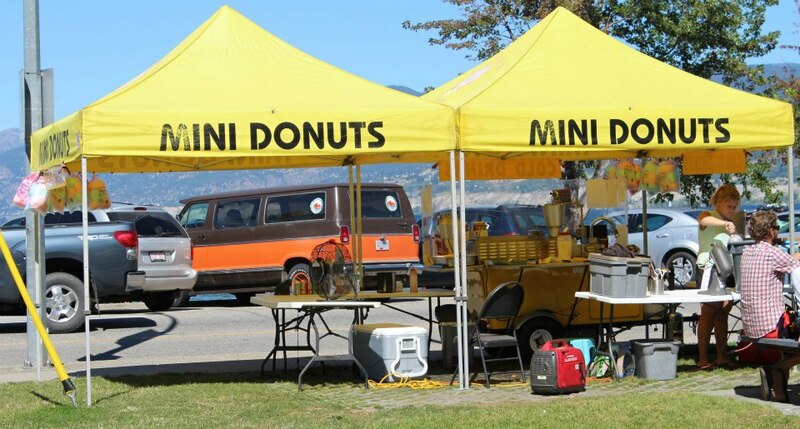 About 1 mile from the finish, I smelled those awesome homemade donuts from the street cart. I kinda wanted one. I could hear the crowds, the music and the announcer now. The people on the streets were amazing. All I kept hearing was “you got this!”, “congratulations Pim”, “good job Ironman”, “you go girl”. I looked up and said “thank you” to each person. Jerrold and gave each other one last high five as he headed in the opposite direction towards the finish. I made the turnaround shortly thereafter. It’s very real now. I told myself, “don’t cry, you don’t want your finish photo to look bad”. I almost lost it just before I entered the chute so I stopped looking at people. As soon as I’m in the bright lights, I could hear the cheers and the people banging their hands on the boards. I heard Ron call out my name. I saw his hand extended and run to give him a high five. The next few strides go by almost too fast! I needed to run slower! I was so happy, I wanted to jump in the air. I raised both hands up. I heard “Pim Kunakasem, you are an Ironman”. Next thing I knew, I was grabbing the banner. Ron teased me later that he thought I was going to run off with it. I had so much energy and legs left, I could have kept on running for sure! My average heart rate was 138 bpm, much lower than usual due to my GI issues and I managed to pass 179 people on the run. Coach Tom told me that this is one of the few times as an adult you will feel nervous and excited like a child. He was right. Words cannot describe how I felt. People tell me that the song “Time of Your Life” was playing. It was the perfect song for me! About 5 minutes after I crossed the finish line and posed for my finishers photo, my stomach reminded me it was not happy. My feet were also pretty sore. Joe R who had an amazingly fast finish saw me sitting in the recovery area and hangs out with me. I managed to eat a couple bites of watermelon. I knew I needed to get water and protein in but I couldn’t even look at the pizza. I head over to the medical tent and the nurse there assured me that what I felt was normal and would eventually pass. She told me it’s ok if I don’t feel like eating right now. I would eventual vomit on the ride home. Thanks Ron for soothing me at that moment. I didn’t quite feel like an Ironman as I stuck my head out of the car door. That evening, I managed to eat half of plain toast and drink a little flat Sprite. The next morning I ate the other half and drank more Sprite. An hour later, I was able to sip ½ of a frozen coffee drink. The caffeine and sugar perked me up. By lunchtime, my stomach had finally restarted and I was able to eat a whole quiche. By the next evening, all I wanted for dinner was ice cream. 1) Draft behind someone who is a faster swimmer than you or just swim without drafting until you find a swimmer at the right pace to follow. Exert some effort so your muscles stay warm in the water and prevent cramping. 2) Don’t try anything new on the run course. Trust that the salt sticks and water will be enough. 3) Take the Tums and Advil you are carrying. Your stomach is already messed up. It can’t get any worse. 4) Trying to catch up on hydration too quickly equals lots of portal potty stops. 5) Just let yourself vomit and get it over with. You’ll feel better after.